Galerie Bernheim-Jeune, Paris, by whom purchased from the Artist in 1924. Jean Dauberville, Paris; sale, Sotheby's, London, 10 Dec. 1969, lot 48, where purchased by the present owner. F.-J. Beer, Bonnard, Marseilles, 1947 (illustrated pl. XV). J. and H. Dauberville, Bonnard, Catalogue raisonné de l'Oeuvre peint 1920-1939, vol. III, Neuchâtel, 1973, no. 1226 (illustrated p. 191). New York, Wildenstein Inc., Pierre Bonnard, 1934, no. 22. Paris, Galerie Bernheim-Jeune, XXXIV Peintures de Pierre Bonnard, 1946, no. 30. Paris, Galerie Bernheim-Jeune, Rétrospective Pierre Bonnard, 1950, no. 55. Nice, Musée des Ponchettes, Pierre Bonnard, 1955, no. 36. Paris, Galerie Bernheim-Jeune, Hommage à Bonnard, 1956, no. 48. Paris, Galerie Bernheim-Jeune, Visages et paysages de Bonnard et de Vuillard, 1957, no. 7. Rouen, Musée des Beaux-Arts, Paysages de France, 1958. Paris, Galerie Bernheim-Jeune, Paysages de France, 1961, no. 4. Moscow, Sokolniki Park and Leningrad, Hermitage Museum, Exposition d'Art Français, 1961. Saint Denis, Musée d'Art et d'Histoire, Les Peintres et la nature en France depuis l'Impressionisme, 1965. London, Royal Academy, Pierre Bonnard, 1966, no. 202. Oslo, Kunstforbundet, Pierre Bonnard, 1966, no. 29. Munich, Haus der Kunst, Pierre Bonnard, 1967, no. 108 (illustrated). Paris, Musée de l'Orangerie, Centenaire de Pierre Bonnard, 1967, no. 60. Marseilles, Bonnard, 1967, no. 20 (illustrated). Humlebaek, Louisiana, Bonnard, 1967, no. 60. Le Cannet, Hôtel de Ville, Bonnard et ses amis, 1968 (illustrated). Tokyo, National Museum of Occidental Art and Kyoto, National Museum of Modern Art, Pierre Bonnard, 1968, no. 66 (illustrated). When he painted Paysage classique in 1924, Bonnard was dividing his time between the North and the South of France, spending his summers at Vernonnet, near Paris, and the winters on the Riviera at Le Cannet, where he eventually bought a house in 1925. He was attracted by this small village whose houses on the hill had a tremendous view over Cannes, the Golfe de la Napoule, and the mountains of the Esterel. 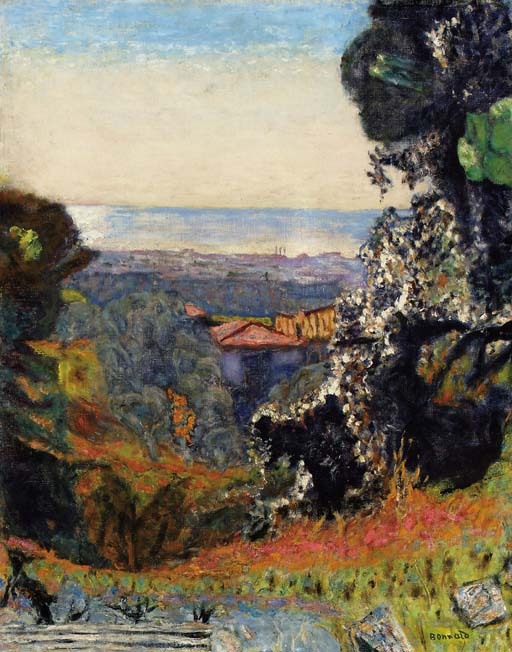 The composition and motif of Paysage classique, with its view of the town below and the Mediterranean in the background, framed by trees on both sides, is one which Bonnard frequently used in Le Cannet. He would use the same viewpoint a year later in his painting titled Paysage du Midi now in the Kunstmuseum Winterthur (fig. 1). In Paysage classique, Bonnard seeks to balance a structured classical composition with his decorative imperatives. As Nicolas Watkins points out, 'Bonnard's solution to the problem of reconciling depth with the decorative assertion of the surface in the painting was to treat the landscape as a kind of tapestry into which the view was woven' (N. Watkins, Bonnard, London, 1994, p.156). Bonnard expresses the luxuriant aspect of the countryside its rich sinuous textures, the vibrancy of southern light, at the same time as instilling a sense of permanence. While working in Vernonnet, Bonnard looked to Monet's fleeting Impressionist landscapes. In this painting he initiates a dialogue with the classical landscapes conceived by Poussin, Claude, Corot, and Cézanne. But, most importantly, like so many artists before him, and particularly Renoir who had worked in the nearby village of Cagnes-sur-Mer, he sets out on a personal exploration of the different formal and pictorial possibilities offered to him by the colourful Mediterranean landscape.